BEFORE you start an exercise program! Cardiovascular or aerobic exercise is any activity that increases your heart rate for an extended period of time. The key to beginning or re-starting any physical activity after a stroke is to start slowly. Start at a low intensity and gradually increase your capacity. • Stroke survivors should exercise at a level between 40–70 percent of your maximal heart rate, which is 220 minus your age. So for a 70–year–old survivor, maximal heart rate is 150; 40–70 percent of that is a range between 60 and 105 beats per minute (220—70 x .40 = 60 and 220 —70 x .70 = 105). Ask your doctor how your medications may affect your heart rate during exercise. • Take the talk test. If you are exercising at a good rate, you should be breathing enough to talk, but not to sing your favorite song! • On a 10-point scale – where sitting is 0 and working as hard as you can is 10 – moderate-intensity aerobic activity is a 5 or 6. It will make you breathe harder and your heart beat faster. • Consider buying a heart rate monitor for peace of mind. • Smart phone apps allow you to measure your heart rate while you are exercising by placing a finger over the phone’s camera. These apps also allow you to track you progress. 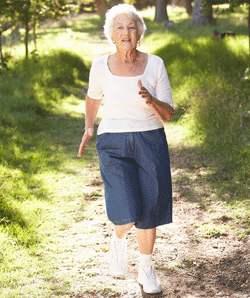 Stroke survivors often want to begin exercising after a long period of inactivity. Muscles have atrophied and aerobic capacity is very low. The best way to start is with 10 minutes of physical activity at a time and even this can be broken down into 5 minute segments. Your exercise prescription should recommend being active most days of the week. As strength and endurance increase, frequency may be able to increase as well. Start where you are. Set reasonable goals based on your current condition. Start slowly. Don't try to move too quickly - build up your endurance over time. Pain does NOT equal progress! Track your progress. Chart your progress so you can't miss the improvements. Seeing incremental changes is very motivating! Choose an activity you enjoy! Do you like to swim, or walk or dance? Any of these can be aerobic workouts. You do not have to be ambulatory to improve - march in place and swing your arms to music from a seated position. Share your successes! Tell everyone about your accomplishments. Start where you are and move forward!